Oh, hi. Did you miss me? Are you hoping for a new you’ve-got-to-make-this-omg recipe today? Well, I’m sorry, because apparently the flan was just the beginning of a string of cooking failures. It’s a shame because I was really excited about this one. First, it was quiche, and real women, you know, eat quiche. 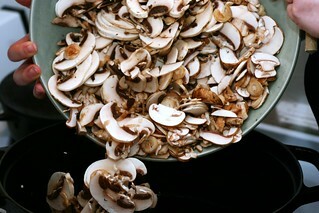 Second, it had two pounds of mushrooms in it, and I have a mushroom story (no, not that kind!) I have been meaning to tell you for a year, and this would have been my perfect chance to share it. Third, it was a Thomas Keller recipe, and although I may not be his number one fan, I hear that the man can really cook. Finally, it was called “over the top” and if there is one thing I can’t say no to, it’s a dish a simple as quiche made into something absurdly involved. Okay, I was kidding on that last part. Or was I? As you can see, this cooking experience has left me all sorts of wobbly. The truth is that I knew it would be ten times fussier than your average dough + filling + bake = quiche but I was intrigued. The photo on Food & Wine looked so towering. Nobody would ever write a mocking tome about it. But yet again, it was a dough that felled me. Or more specifically, the way it was supposed to be baked, which while we are on the topic, was ridiculous. Because this quiche was so big, Keller has you bake it in a springform instead of a tart pan. Fine, nothing too crazy yet, right? Well, keep reading: Keller has you do away with the springform’s base, placing it instead on a parchment-lined baking sheet and then brushing the inside of the ring, which you have left unclamped, with canola oil. Because you had nothing else to do with your evening than deconstruct and rebuild a baking dish. Evidently, I sure didn’t. Because the original play-by-play of what went wrong with this quiche was so long-winded, even I dozed off reading it, I’ll try to keep this simple: I forgot to properly anchor the first crust I made to the outside of the springform ring, and the walls collapsed when I par-baked it. Then I took a deep breath and made a second dough (see: nothing else to do with my evening), this time anchoring the heck out of it, only to find that it instead broke in the oven, the overhang falling onto the baking sheet, and the interior walls floating down their mold, yet again. Out of ideas, I decided to fill this second shell as best as I could, only to learn that it had some mysterious leak somewhere, the pan flooded and the whole thing went in the trash. At this point, the first quiche shell was looking like my last hope, and with half of the remaining filling and custard, I managed at 10 p.m. to pull something out of the oven that was actually edible. Did you hear that? Edible. I’ll even grant it “tasty.” And we’ll probably eat the leftovers, too. My god, after all that time and two crusts, we had better, or foist them on friends. But in the end, even with all structural concerns aside, it’s just okay. Good, not great. Save you energies for the mushroom and leek version I told you about in January. Anyway, I could chin up about one disaster in a week, but when a second and third one strike in one night, I’m nearing my wit’s end. But there is a light at the end of the tunnel, my friends, and that is what I made for dessert. I can’t wait to tell you about it tomorrow. It could cure anything. It almost did. Oh, how disappointing. I love to see mushrooms pop up in your posts and I am saddened that they didn’t turn out well for you. Well, not the mushrooms themselves, I suppose. But the whole thing. Are we not allowed to hear your mushroom story, now? Also, way to bait us for tomorrow! Such a tease. Oy, how frustrating. I had cut out this recipe, too, because it looked so good and the F&W write-up was so laudatory… Is there anything more exasperating than a pain-in-the-%#* recipe that ends up being just…feh? I’ll guess I’ll be passing on this one… But I can’t wait to see the dessert recipe! Listen…all I can say is use the NY TIMES Quiche recipe from the 1970’s! It’s foolproof and OH SO TASTEY! I had a quiche craving a month ago and it was super-dee-duper! I was watching Martha bake quiche with the woman who wrote the cookbook Tartine. No disappointments what-so-ever. Can’t wait for to hear about the DESSERT! Hang in there – we still love you and completely trust you. :-) Here, have another glass of wine. Let me tell you, even despite all the troubles, when I looked at that last picture with the quiche next to the (surprisingly gorgeous) green salad, even *I* wanted to take a huge bite, and I haaaaaate mushrooms. Keep at it! I feel your pain. Last night I messed…brace yourself….NO BAKE COOKIES. The ones you learn to make when you’re 8 years old and you want cookies but your mom won’t make any and you don’t live within walking distance of, well, anything so you HAVE to make something so you make No Bake Cookies. I think I added 3 cups of sugar instead of 2. I got distracted and lost count (yes, I can get distracted when counting to 2. Laugh it up.) so I added another cup just in case. The result? Dry, somewhat gritty cookies that the husband ate without complaining. They were intended for the father in law but I refuse to serve such a disaster to one of my biggest fans. I firmly believe that we all have ‘off’ days when we aren’t meant to set foot in our kitchens. That is why God invented restaurants. Ooof, that leaking tart is a sad and disappointing sight indeed! I think the springform pan is a bad idea with SUCH a liquid center, and I think they asked for too much oil for cooking the mushrooms. 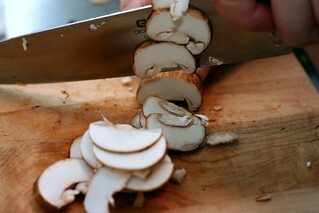 Fine Cooking had a great article once on how to sear sliced mushrooms so you get max flavor and color without steaming them. If I was going to do this I would go with a giant deep-dish pie pan. You would still get the height and you couldn’t have a leak. Esthetically, his quiche reminded me of a deep-dish Chicago-style pizza. When I was an Atkins dieter I made crustless quiche. You line the pan with slices of Swiss cheese broken to fit, not worrying about holes (obviously, with Swiss, LOL!). It made the most delightful “crust” and was even wonderful cold. I only put Parm or Asiago cheese in the custard with this, though, so as not to gild the lily. Don’t give up on quiche–it’s just too sublime. Oooh, can you make up a mushroom story of “that kind”? I love those. This is the sort of recipe I look at and then weep over having to do things like “work” and “parent” and “play Wii obsessively”, because they grant me no time for bizarre baking experiments. Then I go make Missouri cookies and feel better. Superblondgirl, I can sympathize–“playing XBox 360 excessively” seems to be a big time-eater for me. Who has time to cook when you’re saving the world from aliens? You’re a better woman than I. I would have cried, chunked the first one, and ordered Papa John’s. The end. 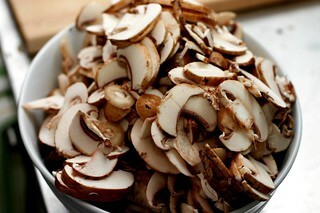 Mushrooms are disgusting! Those close ups made me throw up in my mouth a little bit. I’m with Abby, only I would have thrown out the first one and poured myself another (I’m sure I’d be well onto my 3rd if I’d had an evening like that) glass of wine. Even after all that your picture still looks beautiful and mouthwatering! It must be the week for Kitchen disasters. I have been trying to make a great Muligatawny soup and decided to experiment. Lets just say it involved Rice and a slow cooker and I renamed it Muligatawny GOO. The sad part is the flavor was actually pretty good if you could get past the texture. But it makes me feel better that I am not alone! I am an evil, evil person for laughing at your misery. But you write so damned well about it. I frequently prepare quiches in springforms (I didn’t know the English term but obviously it’s the same as in German) and I’d say the trick is to put the springform in the fridge or freezer for half an hour after you have lined it with the dough. 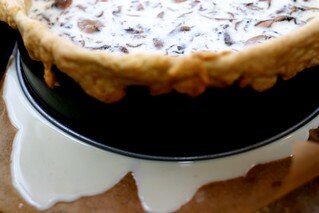 This way there will be no melting but the dough will directly transform from cold and stiff to crunchy. No worries Deb, something amazingly wonderful will come soon enough. By the way, I finally tried those peanut butter brownies. HUGE hit. Except now people want me to bake all the time, as much as I’d love that, I kinda have a job too. When I was in the beginning of my pregnancy with my daughter, my hormones must have conspired against me because NOTHING I cooked turned out right. It was awful. In fact, more than one person told me they were relieved her conception happened during the summer months and wore off before Halloween, otherwise Thanksgiving and Christmas would have been disasters. Then again, my pregnancy with her was the only time my tried and true fudge recipe ever failed – and it failed every time I tried to make it that year. I know there are other reasons besides crazy hormones to go on a cooking losing streak, but it sounds like you’re rebounding nicely. crust is the worst! i have never succeeded in making something beautiful- only patchy franken-crust. speaking of thomas keller, i don’t think you ever told us about your dinner at ad hoc on your napa grilling trip. i love ad hoc, so i hope it was good. You are quite the trooper! voila! little to no shrinkage, just baked enough not to get soggy and the edges don’t burn when I put it into for the final bake with filling. Sounds utterly, painfully frustrating. Although I’m game to tackle a complicated recipe any day, I’ve been gaining more appreciation for ones that call for good ingredients and a simple preparation. Speaking of which- I cannot wait to try that butternut squash tart you posted about. It looks right up my alley! And what’s this about a mushroom story??? *HUG* Come on over, I’ll make you a cup of tea. You bring the desert (from your next post – not the flan, I saw pics). Hi there, sory about the disappointing results lately, just wanted to belatedly tell you ow much I love, and am addicted to your site. Was devoted since before your wedding, just stumbled onto it.. Also, I kind of love food, as does my new (as of 3 weeks) husband. We’ve been together for years, learning to cook together as well, and trying new things. we love many of your favourites. 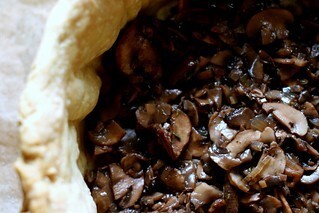 My fave and a big hit with firends is your mushroom stilton galette. I wouldn’t have tried a recipe like this but for your tips/humour. Love your writing! I’ve made a couple of Thomas Keller quiche recipes from his book Bouchon before and they are no joke. It has taken me a few tries to get the recipe down, but it was well worth it. The big difference in this recipe seems to be the use of a spring-form pan without the bottom. In the recipes that I’ve made I used a 9″ round pan with 2″ high sides and a removeable bottom. 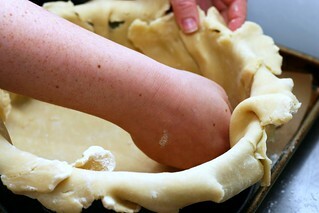 The dough can be tricky, but it is the most important step as it is the base of the whole dish. It is important that you leave enough dough hanging over the side so it doesn’t shrink down into the pan. It is also important that the dough be thick enough to support the filling. I’ve also had some issues with leaks from the pan, so I always make sure to go back and patch any possible holes or thin areas after the blind bake. I always make this quiche the day before, because it is better if it can chill and really set overnight. The next day I take it out, slice, and reheat it in the oven and it is wonderful. HIGHLY RECOMMENDED!! Oh, my … I’m surprised you’re still standing straight. I get frustrated by just reading about your rumble in the kitchen. And the pain is particularly great when quiche is supposed to be so darn easy anyone can make ’em. Last time I gave it a try, the egg mixture drizzled like a spring rain onto the over floor. That smell … burnt egg. Frustration at its best. First time poster, long time listener. The problem I have with mushrooms is dealing with the water content. I like large slices that are not overcooked. When I add to the egg, I am nver happy with the result. I think i need Sauteing lessons. My wife diverged from her normal quiche recipies this week. She used Shredded potato to line the bottom of a Square Pyrex instead of pastry. Came out as this egg/cheese over rosti that was fabulous. Keller’s pastry recipe is the one I always follow now when making quiche, but I too had a hard time with it, mainly dealing with the shrinkage. Here in the land of quiche (Paris, France) I thought, heck, I have the right pan, the right flour, the right everything, so what could go wrong? Five quiches later I still haven’t figured it out totally, but I’m comfortable. So Deb, I feel your pain. Hang in there, we all love you still! That quich looks amazing ! I am a big fan of mushrooms so this seems really tempting! mmmm this quiche looks wonderful!Can you spare a slice? Oh, sweetie! I have made this (and other Keller quiches) more than once. The secret is to ensure that the crust is pre-baked and that before it is baked, you plug any potential holes with extra pastry. It sounds like a challenge but the result is well worth it. I even had a 74 year old friend eat it – until he discovered it was quiche! It is definately worth the effort, even if it does take a whole weekend! In the dissapointing recipie vein: I just made some spice cupcakes with cream cheese frosting. Sounds nice and autumnal, no? They taste like BACON. I’ve got no idea how this happened. Its completely distressing. 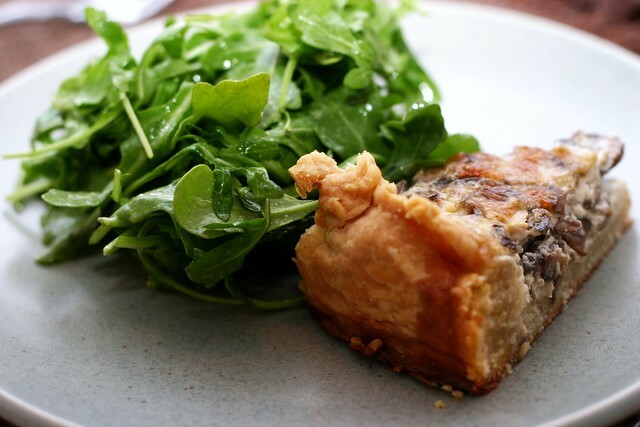 I’ve made this quiche many times…no problems…and gets easier each time. 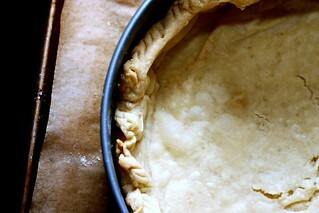 Make sure after you place the pie pastry in the ring mold, stick it in the freezer for @ 30 minutes. I now finesse this crust with no breaks, cracks or otherwise. The Leek/Roquefort quiche is the least time consuming and very good. Without doubt the best quiche I’ve ever eaten. Really, most quiche that is served to us is overcooked frittata. The silky, custard filling of TK’s can’t be beat. I can commiserate on your problems with the crust; I think Anja’s idea of putting the pastry-lined springform in the fridge for 20 to 60 minutes is good and, having read the book an hour ago I see that it is in there. You absolutely must keep all the pastry components and treatment as cold as possible – a point he alludes to. Using a springform? I wonder if that is necessary. He emphasises that he wants the 2″ depth which ordinary flan cases don’t give you but I would think any bottomless cake tin would do (you are going to grease it and he tells you to run a knife around before removing the quiche). Also I am concerned about Keller’ss cooking times – I prebake for 7 minutes, remove the beans and then give 2 to 3 more minutes. Yes – I use a shell thinner than Keller’s 1/4 inch and prick it extensively but the difference between my 10 and his 50 – 65 minutes is large. Eyeball it and good luck next time. found this older post via the pumpkin bread pudding recipe in the thanksgiving index (so loving the cataloging!) and i had to write that I HATE THIS QUICHE RECIPE MORE THAN LIFE ITSELF. i never got past my THIRD attempt at the STUPID dough wrapped around the unhinged springform. let’s brush canola oil all over a nonstick springform and dare the all-butter crust not to slither down the sides in collapse. time well spent. Sorry to post so late but I am new in blog reading, I couldn´t stop laughing because I was also very impressed by this over the top quiche recipe when I saw it on food&wine, the first time I tried it was also a disaster leaking included, not fun indeed. 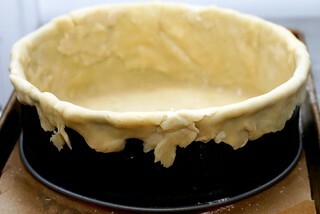 But I have got better I have to say, I brush my pastry shell with an egg wash the last 20 minutes of baking, then I make sure there are no cracks o holes, it also helps to pour the filling when the crust is still hot so the custard starts setting before it leaks. I, too, made this quiche. I somehow didn’t infer that you’re not supposed to use the base of the spring-form pan, but even so, it leaked disastrously – and not because of a tear. The crust got so soggy from the custard that the milky business was oozing through the baked crust and leaking out of the bottom edge of the pan. We were left with some mushrooms, a gooey crust, and a big mess. Not much fun, TK. Not much fun. What a shame it would be if only pros were allowed to make quiche! Fortunately, there are food blogs that encourage even “casual home cooks” in their kitchen experiments — even tarts and quiche. This is about the third time I’ve made this. I’ve no problem with the crust… as I know to eyeball the consistency, which also depends how you make it. I did mine in a food processor. One problem I had was… the amount of salt in the Quiche Florentine recipe is too much for my palate. The cheese is plenty salty already, (used a gruyere). Also the egg was not a consistent custard, but was more granular in texture. These were my ingredients: 3 strips of Applegate Farms Turkey Bacon (subs. for reg bacon). Cremini, Shiitake, and Oyster mushroom mix (instead of onions), tossed on top of the layers of spinach with shallot mixture. Oven roasted grape tomatoes (cut in half) set in the top of the quiche. Also think I overcooked a bit, and should have eyeballed this as well instead of following the recipe. Try making it again with the crust recipe from this Nick Stellino episode – http://www.nickstellino.com/recipes_display.asp?ind=264 I did it that way and it turned out well. I also mixed it up a little bit and added oyster mushrooms as well. Apologies. I meant to say chanterelles in lieu of oyster mushrooms above. I actually mastered this crust, er, in the years since I posted it. It just took practice. As I’ve gotten better at crusts (always keep them cold, always always always), this wasn’t a big stretch. I’ll update this with more tips this winter. Hi Kate — See above. I did get the crust down, eventually but it coincided with me just getting better at crusts in general. Keep the dough cold no matter what and patch any tears and it works out. Regarding the troubling string of cooking disasters: what is this phenomena? For 2 weeks or so, everything I touched turned to BLAH, or worse. Then, like some cooking influenza, it went away and my husband started looking forward to dinner again. Quiche is my worst nightmare, I’ve made it like 5 times in my life, and every time I’ve made it, it takes so long to make and so many eggs go to waste that I feel guilty about making them :( They are the devils recipe, so I can completely understand what people mean when they say quiche is not my thing. I’ve made this recipe lots of times. I never take off the bottom of the quiche pan and I keep it latched. One of the rare times when I decide to not follow a recipe and do it my own way and it actually works out. I set the pan on a parchment lined cookie sheet to catch drips because I like to fill it to the TOP. It’s an amazing recipe. Also good for traveling to potlucks, showers or holidays because you can leave it in the pan until time for the unveiling. Worth a second try, I’d say! Wow. “I’ll learn from her mistakes and not have to go through that!” Wrong. Dead wrong. Despite neurotic vigilance, I too had a mysterious leak, the whole thing flooded onto my baking sheet, and I rescued it by pouring the still then liquid custard into a baking dish and baking a crustless quiche, which I then topped with salvaged crust scraps. It is my ghetto fabulous quiche. The crust, while a hateful pile of fail, was so delicious I couldn’t bear to throw it away! Secret ingredient: tears. Oh. my. Gosh! Wish I had seen this post before trying to make it and running into the same mystery hole. It’s baking now as the filling slowly leaks out and I just can’t bring myself to take it out- I’ve thrown a rimmed baking sheet under the UNRIMMED one I dumbly decided to use at first so only some if it is burning onto the bottom of the oven- sure hope there’s something left in there by the time it finishes baking but I’m not banking on it- ugh! (And yes, Beth- I was neurotically vigilant about examining the crust too- but not enough.